Marco Rubio bid the Republican race for president farewell last night, leaving the field open to either a dangerous demagogue or an inflexible ideologue to be the party’s candidate. I’ve been reading Sallust’s history of the Catilianarian conspiracy, and I am tempted to think of his remarks about the two most important politicians of his day, Caesar and Cato: in altero miseris perfugium, in altero malis pernicies, “in one a refuge for the wretched, in the other a bane to evil-doers” (BC 54.3), except that neither Trump nor Cruz strikes me as worthy of the comparison. (And yes, I have left our Kasich, who brings to my mind only Don Quixote at this point). We were in Washington DC, as it happens, when Rubio withdrew, and I happened to catch his farewell address on TV. This isn’t actually the photo of Rubio saying goodbye, but his gesture was much like this. This image is like the one that got one of the SuperPACs in trouble with the AP–if anybody from AP comes across this and wants it taken down, just say the word! While I wasn’t especially supportive of Rubio’s candidacy, as I’m a Democrat and all, still, I was sorry to see him leave as I was impressed by what he stood for, the conservative movement’s attempt to make itself over again anew in the wake of repeated Republican defeats. “Rubio, a young and charismatic politician from a Latino background, was seen by elites as the ideal vessel to re-brand those ideas for a young and diversifying America,” wrote the Chicago Tribune this morning of him. Alas, Rubio’s inspiring story of being a Cuban immigrant’s son was lost on the electorate, which saw him as too much a part of the establishment. And let us not the way his primary opponent, Donald Trump, dismissed him as “Little Marco,” a remark about his physical stature as well as his diminished appeal. This morning, before leaving from Union Station for a conference in Williamsburg, I went down to the National Gallery to see the “Power and Pathos” exhibit of Hellenistic bronzes. It really is a very fine display, with some famous statues in it–the Idolino, the Dancing Faun from Pompeii, and some splendid portrait busts. Bronze is so much warmer than marble, so much more life-like, to my mind. The image that struck me this morning as a reminder of Marco Rubio, though, was the life-size image of Aule Metelli, the so-called Arringatore, recovered from Lake Trasimeno. The Etruscans were an Italian people living in what is now Tuscany whom the Romans had uneasy relations with and then eventually conquered. So this inscription is is very striking: Aule is remembered for his Etruscan heritage, which is displayed with pride on his toga–the toga! the most Roman of garments!–even as he strikes a most Roman pose. What to make of this, and of him? 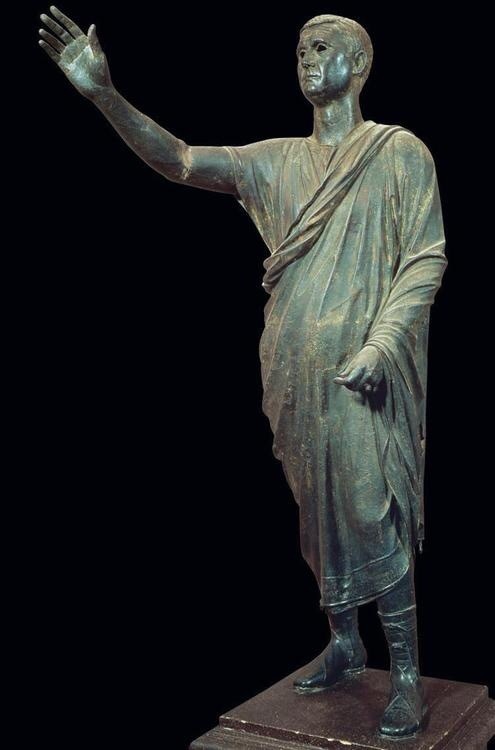 He is a man who’s done well in the Roman world, clearly having achieved a magistrate’s office and wealthy enough to be commemorated by an expensive statue. His foreign status clings to him, somehow, and his parents’ names are certainly not those of a traditional mater and pater familias. What we most notice is his outstreched arm. His hand is raised in a gesture that commands attention–he is about to speak, and is calling for the audience to keep quiet. It is a studied authoritativeness he projects, a signal that he is educated, cultured, worthy and worth listening to. One wonders, however, whether anybody was listening to him. This entry was posted in Classics, Education, Florence, Italy, Pompeii and Naples, Rome, Statues & Monuments. Bookmark the permalink.